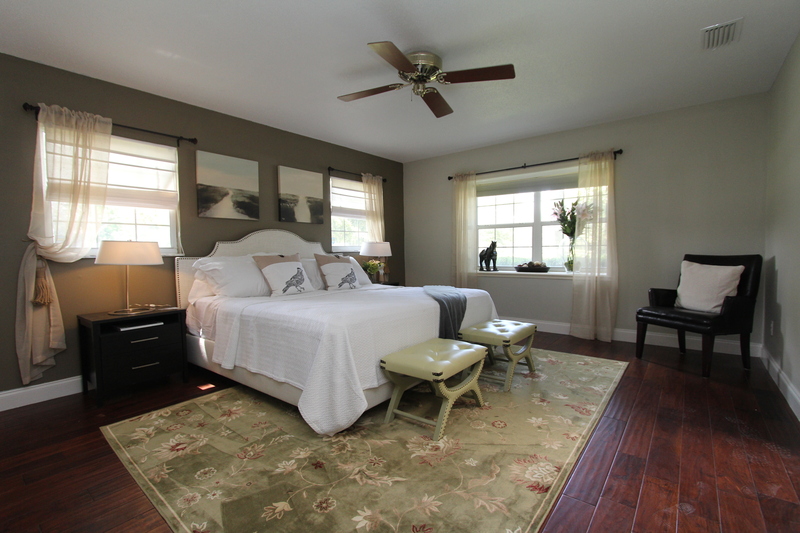 The top 5 reasons why you sell a house that is staged much quicker: It sounds like a crazy idea. 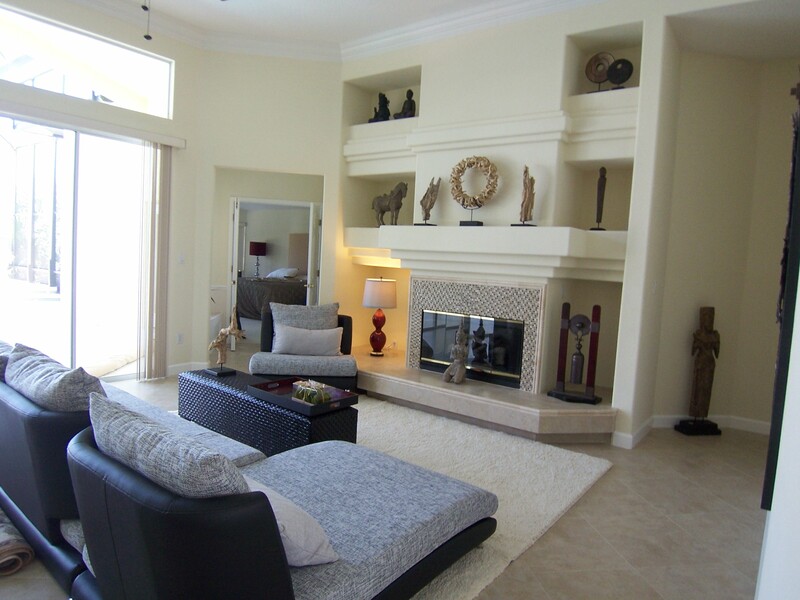 To sell a house one takes the effort of completely furnishing it, just for the time until a buyer is found. Then all the furniture and decoration is removed and the house gets sold without it. This concept is not an invention by the three stooges but used in many real estate transactions nationwide. Why would you want to go through the trouble and cost doing this? The reason is simple. To enhance your bottom line with the sale. Professional staging will have a few effects on your sale. 1) The first and very important benefit is that your advertising will look better. Your pictures will become more attractive and your listing will stand out very much. Buyers start their search online and most likely will look at pictures of your property well before they step foot into your home. If your house looks anything but stunning it may not make it on the showing list. Buyers frequently rule out houses they deem less attractive from the virtual representation found on real estate websites. If you don’t get the potential buyers excited from the start, you may loose them before they even have seen your house. 2) Agents are more likely to put the property on the showing tour. 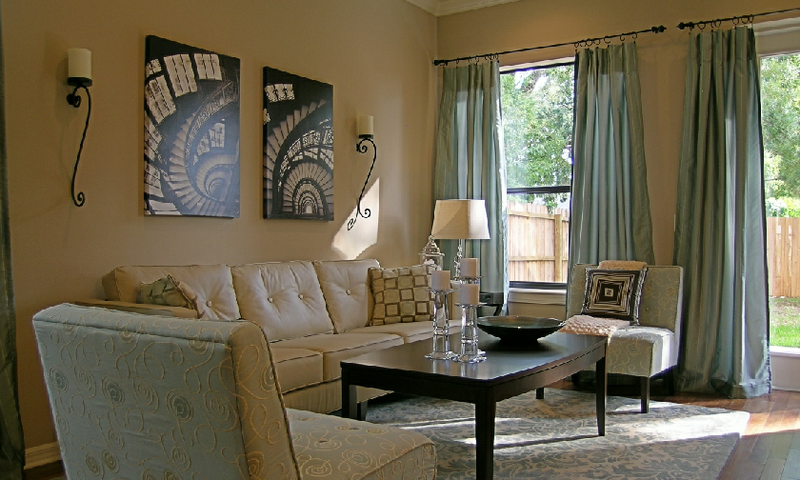 Staging a house signals the real estate professional that you are serious about selling. You have gone through the trouble of making the house attractive and competitive. Staged houses are more likely to be chosen and real estate professionals prefer to have a sale rather on the first viewing tour than on the fifth. So they natural select the houses that will be most likely to create a sale. After all, most Realtors are paid commissions not an hourly wage. 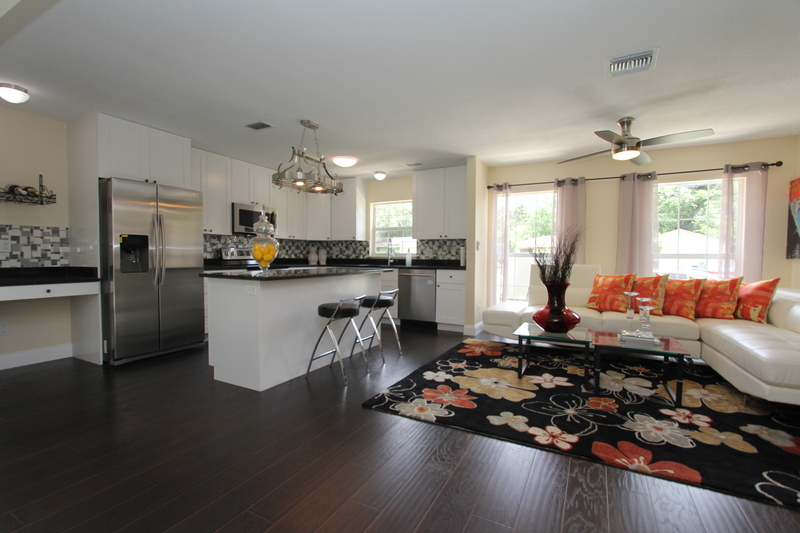 3) Buyers can envision the use of space. Once they enter the home it will present them with an idea how they can use the space. It gives them a reference point to room sizes and how their furniture will fit the space. Last not least it will give them the vision how they could live in the house. It creates a mental picture how they will live after the move to your home. It showcases a lifestyle they could have. 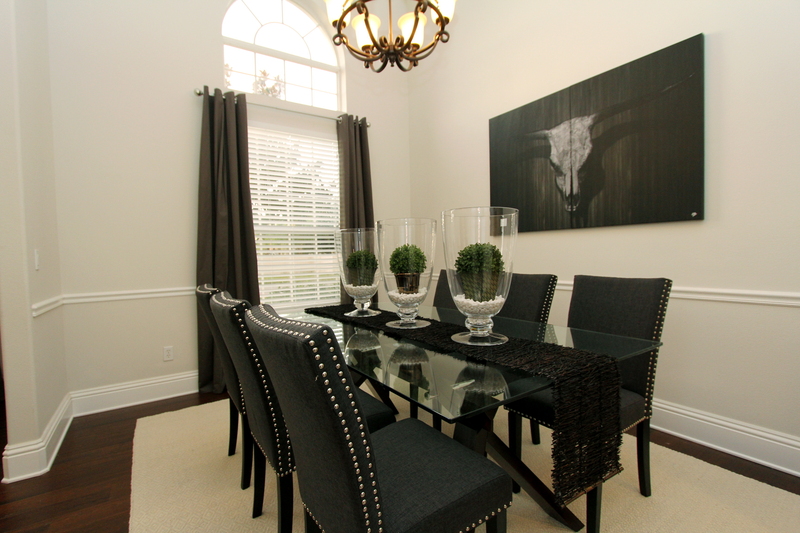 A vision of holiday dinners in the fabulous dining room, moments of solitude and peaceful relaxation in the master retreat, inspiring conversations with friend or a fun playoff party. When they enter an empty house it is difficult for most people to envision how they would furnish it and live in it. The staging paves the road for their imagination. 4) Empty spaces are very difficult to judge sizewise. What makes it easier are furniture pieces who give the visitor a scale to measure the room size. How often have agents heard the words “My King size bed wont fit in here”. One will be surprised how often that assumption is wrong. 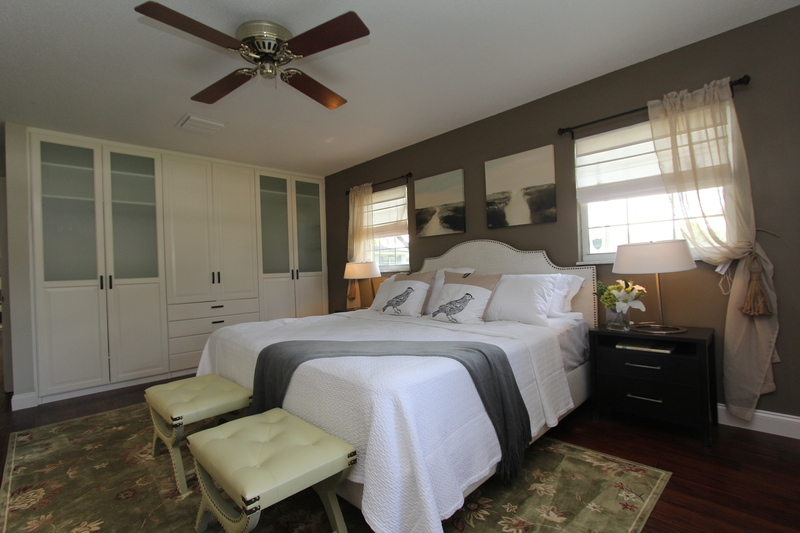 Once your master suite is decked out that questions is off the table. 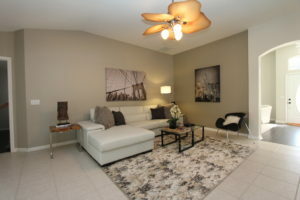 Buyers see how furniture can be set up. It gives them a better appreciation of the space and shows how they could make the best use of it. 5) Buyers start to form an emotional bond to the property. They often fall in love with the decoration although it will not be part of the transaction (at least that is the case in most typical real estate transactions). The furniture gives the home character and ambiance and it helps the buyer to remember it from all the properties they toured. Will they remember any of the empty spaces in any of the vacant houses? The one they remember at the end of the day is the one with the large dining table where they could have the Christmas dinner. The also remember sitting on the comfortable couch while they were discussing who they would invite to the housewarming party. They also remember how they felt in the room. There was something different about this home. The reasons to decide to purchase a home were most likely quite rational: Saving money and building equity; providing stability for the family; locate to the preferred school district to benefit the children’s education, and so on. The decision which house they will purchase is often a more emotional one. The buyers most likely will buy the house that feels right. How can one argue with that. Is your fireplace caught in a time warp? Is your fireplace caught in a time warp? – As taste changes, so do interior design features and materials. Unfortunately, not everything that is old becomes a charming ‘vintage’ element. Not everything turns into a ‘classic’. Some things remain just tired and old and makes a house look dated. 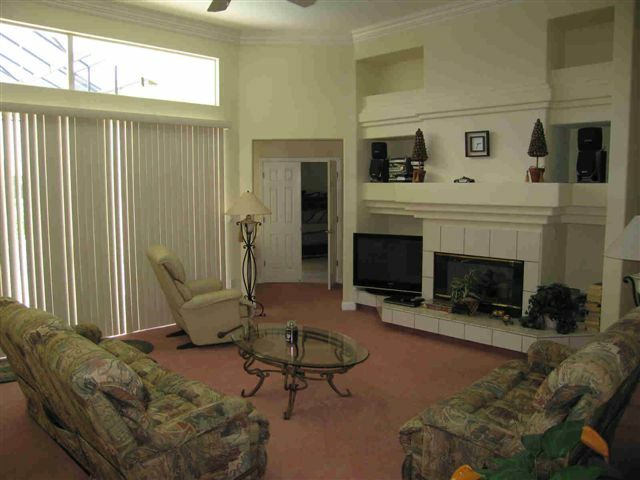 In this example we transformed a family room with some small cosmetic changes. 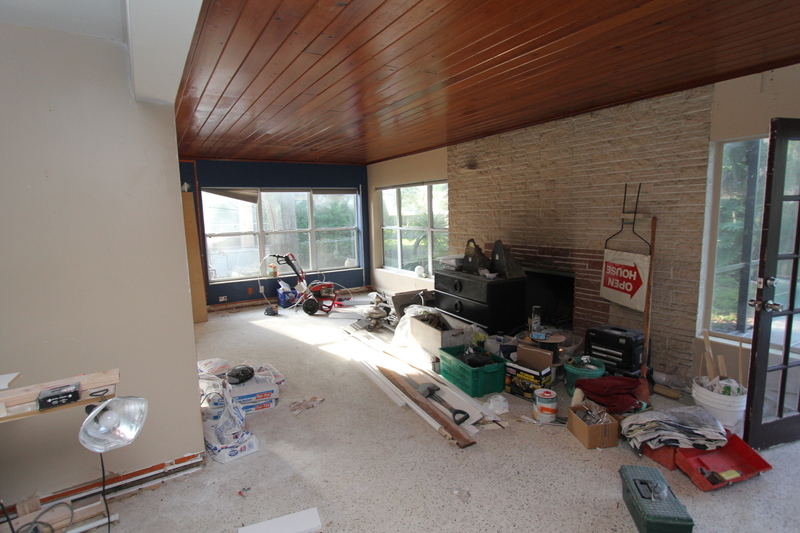 This transformation included removing the small white glossy tile on the fireplace and replacing them with travertine and glass mosaic tile for a fitting and updated look. 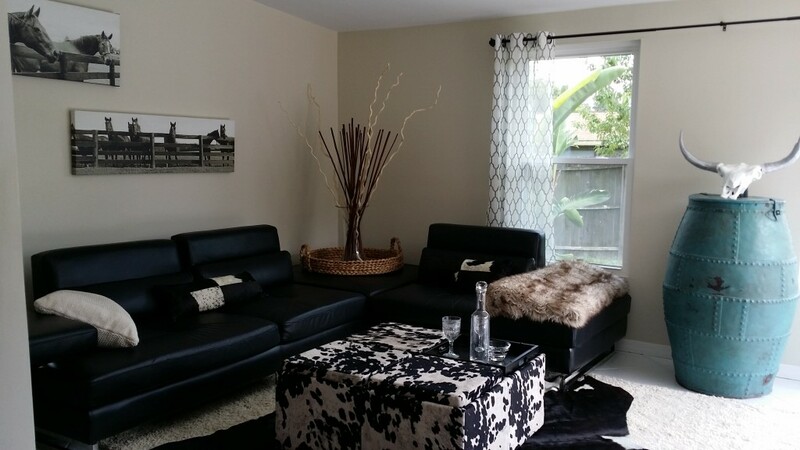 The mauve colored carpet was changed to travertine tile set in a 45 degree pattern and the old and indestructible recliner sofas had to make room for a contemporary sectional that features low lines. The change of accessories and some modern artwork completed the transformation. Not a drastic renovation but a fairly simple update that has a big impact. Sometimes it only takes a few smaller changes instead of the large gut remodel to deliver the desired result. 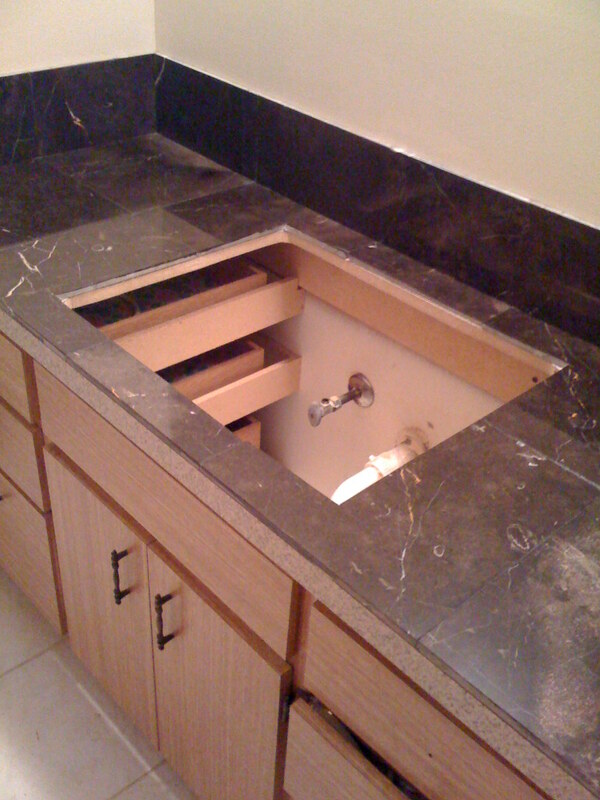 Pick the items that are the worst visual offenders and see if you find a viable solution to replace or update them. In this case the fireplace surround with its 80’s rounded drywall corners is everything but up to date. But with the main offenders removed from the crime scene, this transformation makes the room more palatable and quite acceptable for many people. If you renovate to sell your house, this is the way to go. This renovation yielded twice its cost in increased returns. A truly money making proposition for the homeowner, who sold it shortly afterwards. 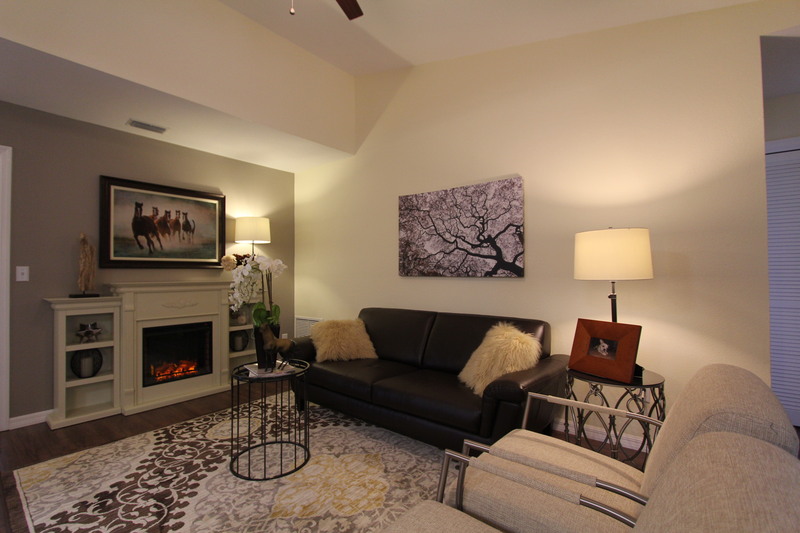 Small cosmetic changes bring the family room into the presence. Consider the view a mirror will reflect when you enter the room. It may give the vistor a whole different perspective on the design. 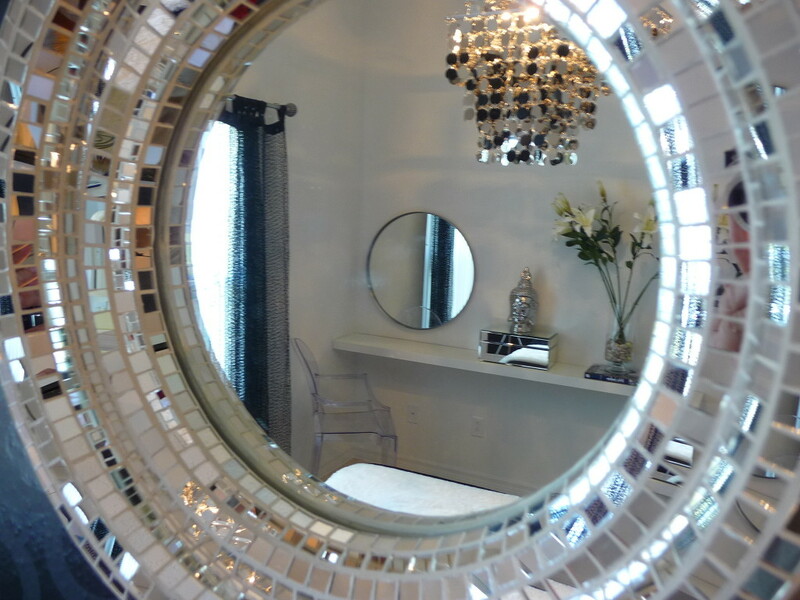 Mirror, Mirror on the wall – How a mirror reflects your style. The question is not why to use mirrors in design but rather why not. Artwork can be very personal and specific and can add great drama to a space. A mirror can do that as well but adds also a different twist to things. A mirror can reflect light where it would be beneficial. So you can use it to highlight an area and use incoming light from an opposite wall as well as reflecting a different angle of the room. It is as you will another viewpoint of the room. So you can take a nice view out of the window and have a mirror project that in another direction. Maximize the assets if you will. The other great benefit is the versatility of a mirror. It is great to anchor a vignette with a console table and fill a wall space. When you have already enough artwork in a room but you want to fill some wall space for a balanced look a mirror is a great option to give you the visual impression you are seeking for. When designing a room you seek for the right balance between empty wall space and items to define the space and create visual interest. You can also use a mirror to mimic somewhat of a window space. There are rooms that are falling short when it comes to window space. A mirror can add that extra bit of natural light by reflecting of the existing windows and bouncing that light back into the room. When placing a mirror it is important to consider what the mirror will reflect from the most likely vantage points of the room. 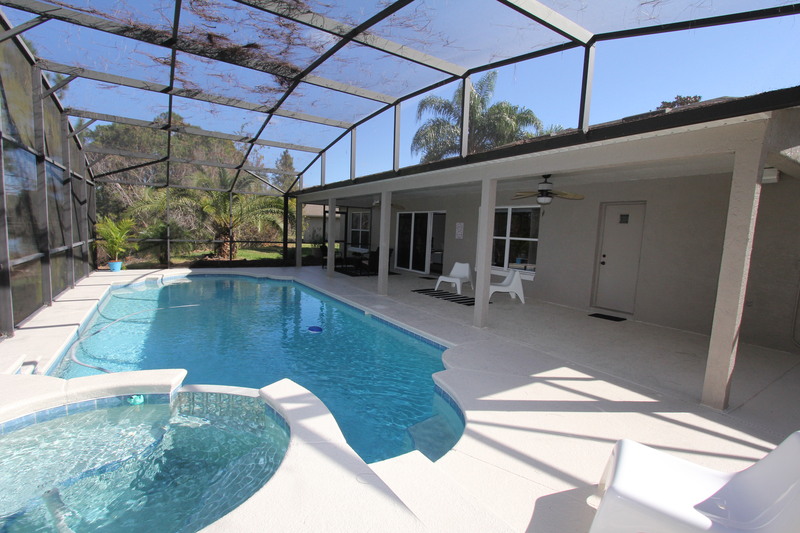 Ideally you want to reflect an angle that adds something to the overall design. 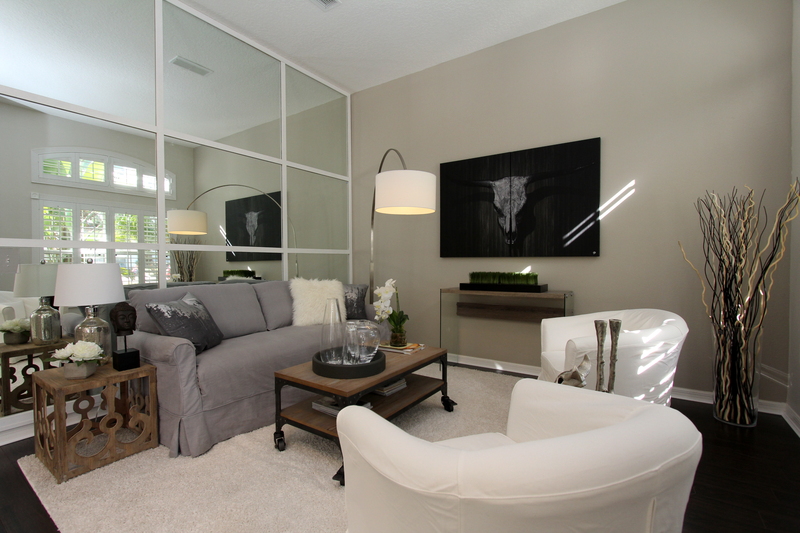 You want the reflection to propose an attractive image of the room when you enter. So placement will be key for the successful design. After all, the mirror will be last not least a style statement, just as the other parts of your design. 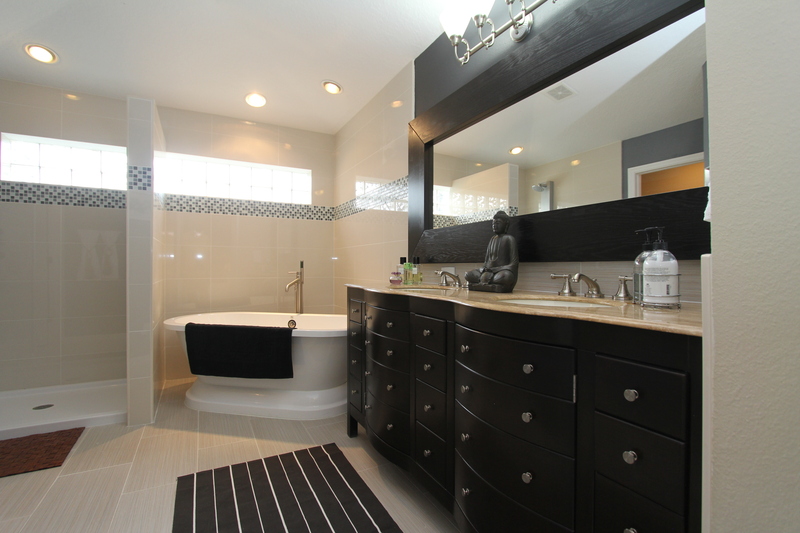 Make sure you have a coherent design concept that integrate the mirror as part of the overall design idea. Don’t let that any item be an afterthought but rather a piece of the puzzle. 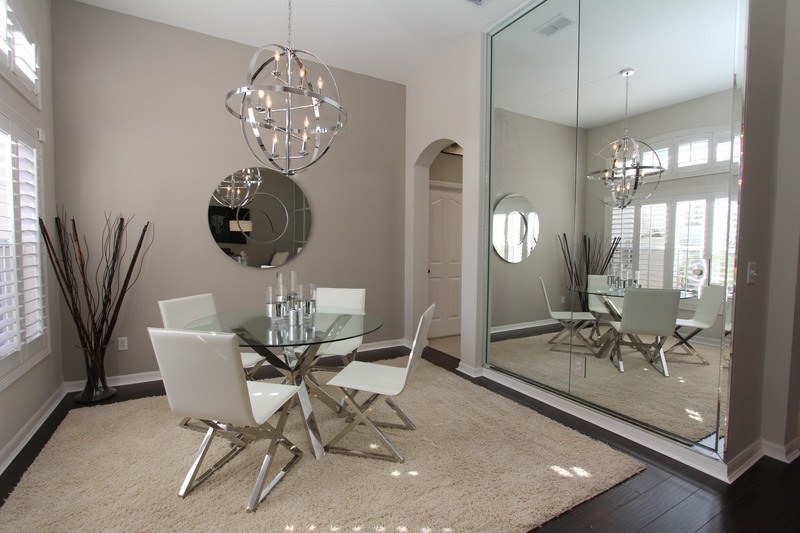 Consider color, texture and shapes when selecting the mirror. 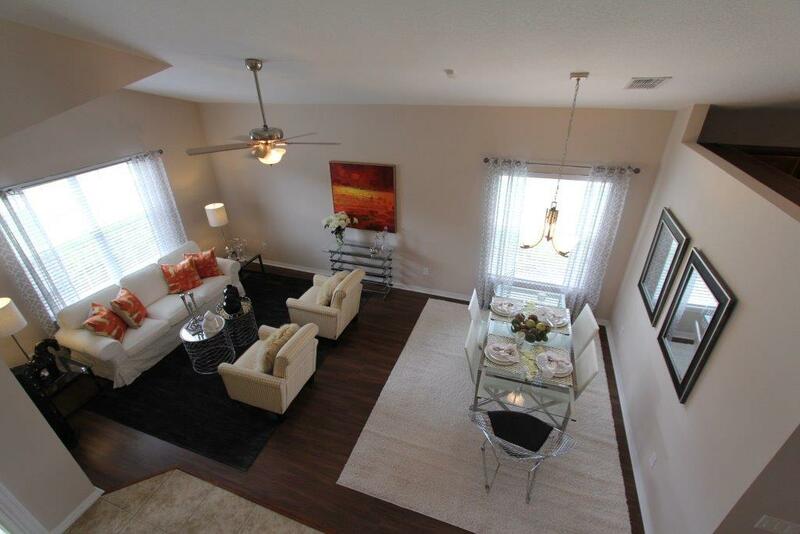 When it accents the room nicely and helps to elevate the design from great to fabulous you made the right choices. You want the design choices to look great and at the same time reflect your design identity. 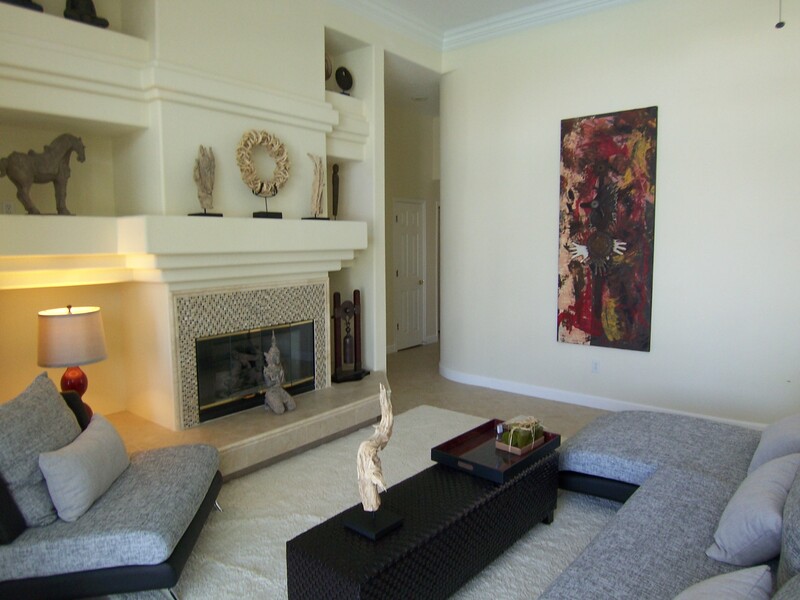 Creating a dramatic accent wall – Sometimes a room can benefit from an accent wall. The designer Helen Bonello-Strauss uses often the wall opposite the door that leads into that room. “I want the accent wall to be the first thing a person see upon entering the room.” The accent wall can be done with a contrasting paint color, Wallpaper, or a treatment with tile or wood. The only limit is what creative limitations you set yourself. 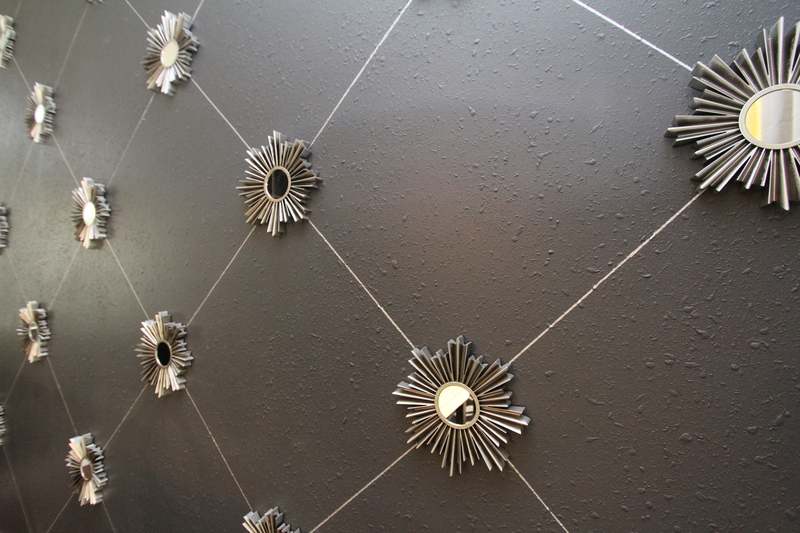 Here is an example how we set a wall apart with an easy and cheap way to create some great interest. The wall was painted in a dark grey. The designer found some inexpensive mirrors online at a design supply warehouse. She ordered up a few dozen of the mirrors and used them in regular patterns on the wall. The lines between the mirrors were done with a long piece of scrap wood as a ruler and a silver felt tip pen from the craft store. This treatment play homage on traditional designs and wall coverings while leaving the wall undamaged in case someone would want to change this wall back to a simply painted surface. This treatment cost less than $ 200 for the whole wall and a few hours of work. Anyone can do this at home. All it takes is an idea and a free afternoon. How HGTV is screwing up the sale of your house – The way real estate was sold 10 or 20 years ago has changed in many aspects. Buyers used to drive around looking for for sale signs or scouted the classified section in the local newspaper. They had to rely on a local real estate agent for information on recent sales and available properties. These days are truly over and todays buyers are informed and demanding. The millennial generation has learned to do their own research online, they know exactly what is going on in the marketplace. Websites like trulia or Zillow had educated them on how much your house is worth. Realtor.com and dozens and perhaps hundreds of other sites show them what is on the market right now. They know school ratings, they know which restaurants are located in walking distance of their favorite neighborhood and they now exactly how many minutes they have to commute to work from your house. They know the going interest rates and have received competing loan offers from different banks. The new breed of Buyers are informed about every aspect of the real estate purchase. They even know how your house should look like. At least in their mind. 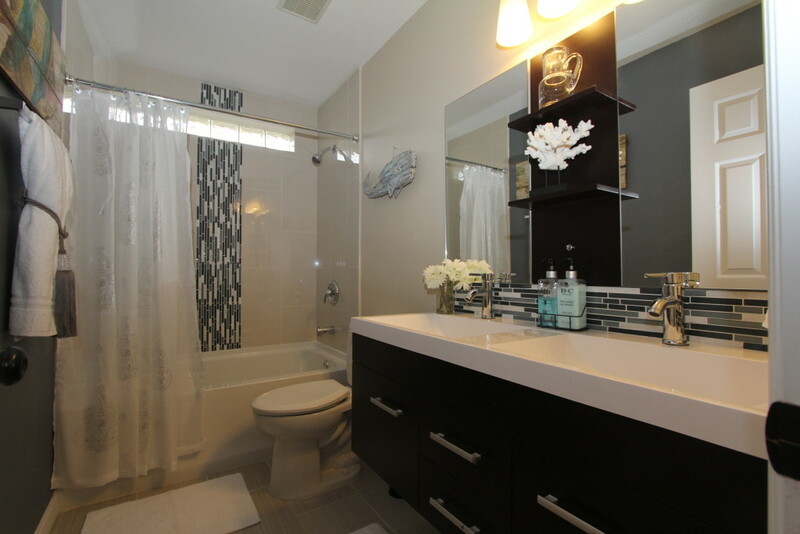 Dual vanities for a shared bathroom are a hit with buyers. “Why?” You ask. The real estate interested buyer has seen on countless TV shows on channels like HGTV, DIY Network and a half dozen others what an army of contractors, designers, and stagers do to properties to make them more salable. They are willing to pay a good price for their next home but they know exactly what they want. They want updated floor plans. They want nice upgraded features. 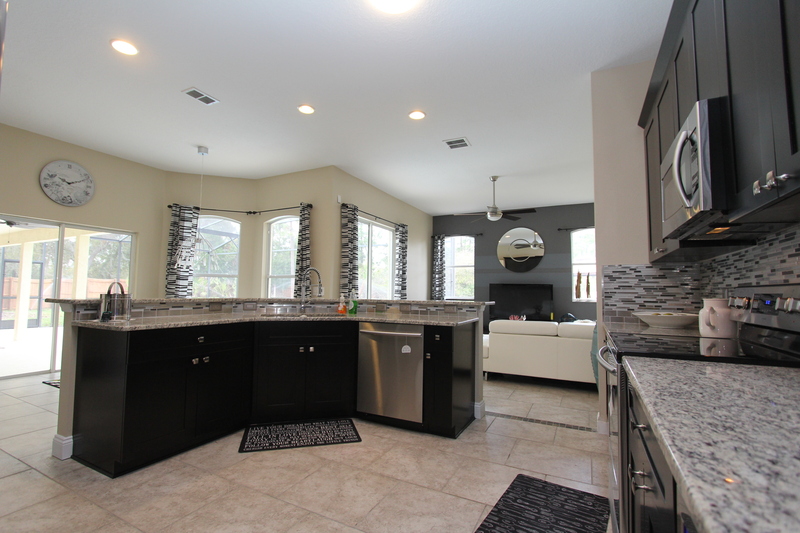 They look for granite counters, stainless steel appliances, nice wood floors, updated light fixtures and most of all a designers vision of what the property could look like. They want to be wowed, they want to be impressed. They have seen dozens of homes on TV that look like a million dollars, and some that are actually worth much more than a million dollars. You, as a potential home seller, are not only competing with your neighbors who are selling their homes, you are competing with the vision buyers have on how their new home should look like. They have seen bathrooms they like, they have seen kitchens to die for, and they already have a laundry list of items they are searching for. Unfortunately the faded wallpaper from the time your house was built did not make that list; Nor does the worn laminate countertops or the beige carpet in your living room. 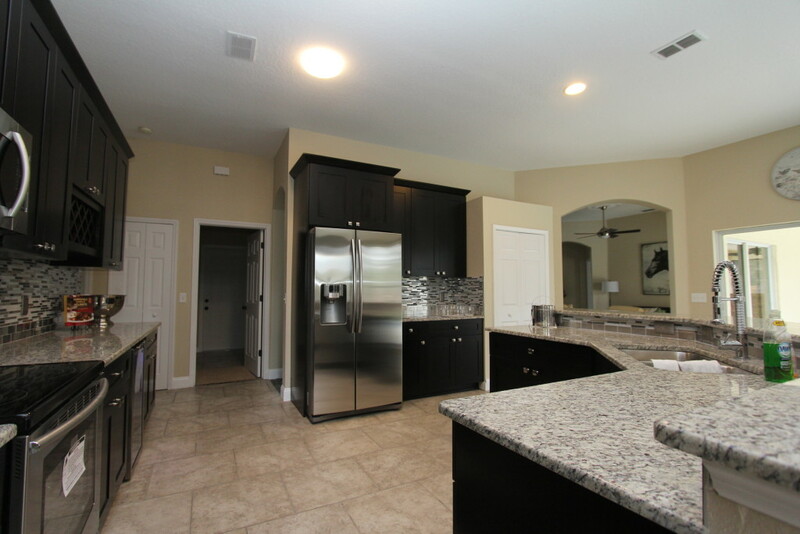 If your house looks in the buyers mind anything less than perfect they will not make an offer or at least deduct a considerable amount of money on the price they are willing to pay for the property. If you do not create a vision on how the property should look like and how buyers would see themselves living in the house your chances of a sale drop significantly. The new generation is all about individuality and the expression of their lifestyle. It is a generation that is used to have instant gratification. It is not the generation that saved up for a decade or two to buy a house. They want it now! They don’t want to go through a long drawn out process of renovating a house but rather have a turn key property ready to move in. Buyers today have certain expectations in life. They have an idea how their lifestyle should be, and how their house will help them achieve that goal. They have a vision that they look to make a reality. They have seen it on TV. 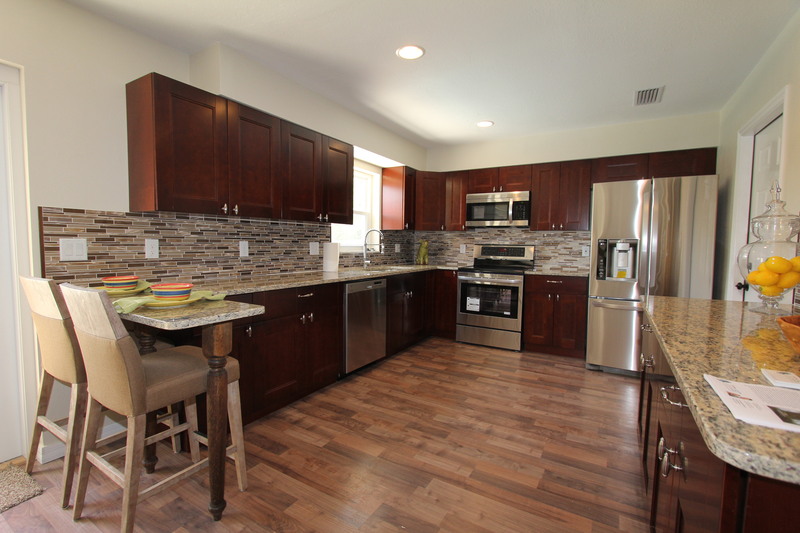 The endless shows of fixer uppers, flipping, decorating and contracting might not have schooled them on how to achieve the results themselves, but it certainly has taught them what they are looking for in your house. If you are hoping for a top dollar sales price you better ‘up’ the game and get ready to deliver. You should seriously consider having a design professional on your team. Remember, your buyers are listening to professional designers for years. Don’t be afraid of dark colors – While often times dark colors can be perceived to make a room look small or uninviting, there is an upside. It is true that dark colors will absorb more light than bright light ones. So a room with dark walls will reflect less of the light coming in. 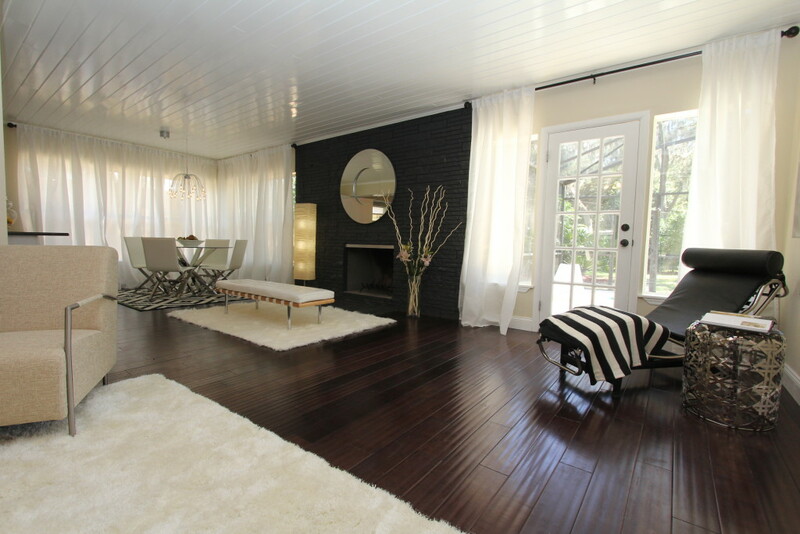 However it can make a space look more intimate and can add drama to it. It also can make the walls less refined and make the space actually appear larger. So the walls disappears into the dark color. The picture below shows a bedroom that received a treatment of the ‘dark side’. 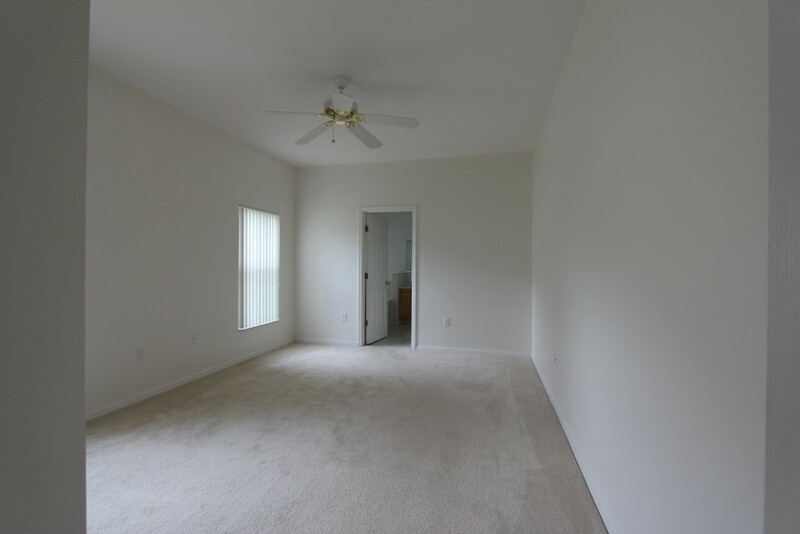 The first picture shows the room with beige carpet and white walls. Nothing wrong with it except that is was so boring, it would put any guest to sleep regardless the time of day. 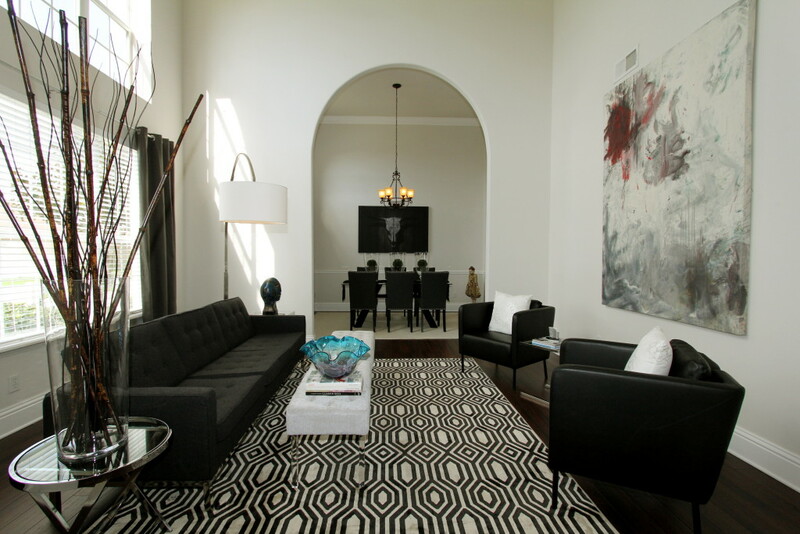 The design solution to this room was to bring visual interest through texture and patterns and a dark rich color scheme with greys, blacks and natural wood tones. 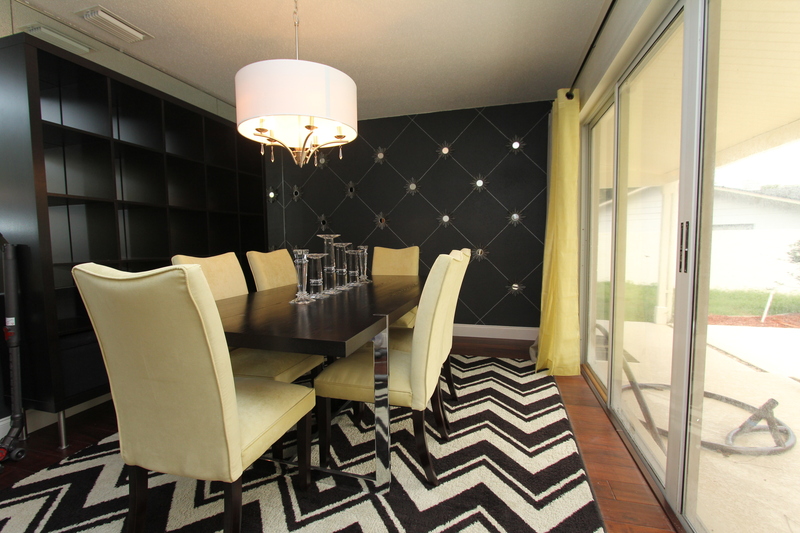 The high gloss wood floor got accented with a chevron patterned wool rug. The walls received a satin sheen dark anthracite wall color with a hint of blue and red in it. The bed with its large grey headboard brings drama to the room and leaves enough contrast to the walls for a great impact. To lighten up the space the designer Helen Bonello-Strauss added a large mirror to bounce off some light on the far wall. Instead of traditional table lamps she opted for bubble chandeliers hung from the ceiling. The downward pointing light works great as reading light. 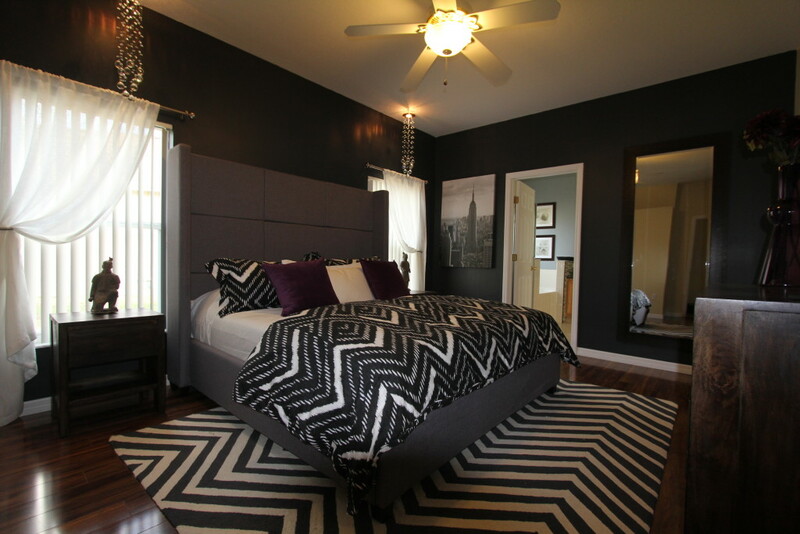 The bedding picks up the chevron pattern in the rug and carries the design theme further. While the room shows drama and strong dark tones is offers a cozy and warm appeal through the use of wood and fabrics. It is a great way to showcase your dark side while staying in style. A boring room lacking identity and interest. Its the perfect blank canvas to do something stunning with it. The dark color gives the room some drama while the lighting and the textures provide enough contrast for great visuals.